As per the recommendation of my customer and now friend from Taiwan. I listed down all of her tips and suggestions on where to take ballet classes in Taiwan. Taiwanese people are really big on ballet. I took a ballet class with her and i was surprised by the number of dancers taking ballet class. Each class was filled with not less than 20 students packed in the studios. I wish that I could have a photo for you but they did not allow us to take any photos of their studios. These studios are in no particular order. All of them are very kind and reply on Facebook immediately, so if you are looking to take class and you would like to know their time schedules you could send them a message in english on their Facebook pages and I assure you they will reply. This studio is very old but the teachers are very good here and a lot of students go here because it is the cheapest option from all of the dance classes in Taiwan. A walk in class will only cost you 400TWD as compared to other studios who would charge 500-800TWD. Just come 20 mins before class and they will allow you to join any of their classes. How to get there: Exit M7 at the Taipei main station. You will see a 7-11 to your left and you turn left to that street then you will see a small door to your Right and go up to the 3rd floor using the elevator. Here is a schedule just in case. The green encircled portions are the advanced classes. This studio different from the Wuyi studio is relatively new. They are one of the more famous studios because they are the organisers of Galas in Taipei. Their teachers are also very good here and plenty of kids and adults take class here during the evening. If you would like to come here go here during the day where there are lesser people. They also sell ballet rosa leotards here, which is a local leotard brand from Taipei. Cost of classes: 500 TWD regular class and 200TWD pointe shoes. The classes encircled in green are the advanced classes. This particular school seems to be famous because this was where Miko Fogarty visited the last time she was here for the Taiwan competitions. I hear that they have one of the prettiest studios here in Taiwan and their teachers according to my friend are good too. You could try it out if you are interested to see their studio. Not everyone would want to take class while on vacation. But I really did enjoy the classes that I took while I was in Taiwan even if I took them all half out because I was pretty tired from all of the walking we did. If you are looking for a friendly ambiance the first studio mentioned was the most comfortable to take class in because they are like a family. Whats good about ballet is that its the same use of words everywhere, and since I knew how to count 1-8 in Chinese it really helped me. Hope this helps for dancers who want to visit Taiwan ! We couldn’t take pictures inside, so this is what we got from the outside. 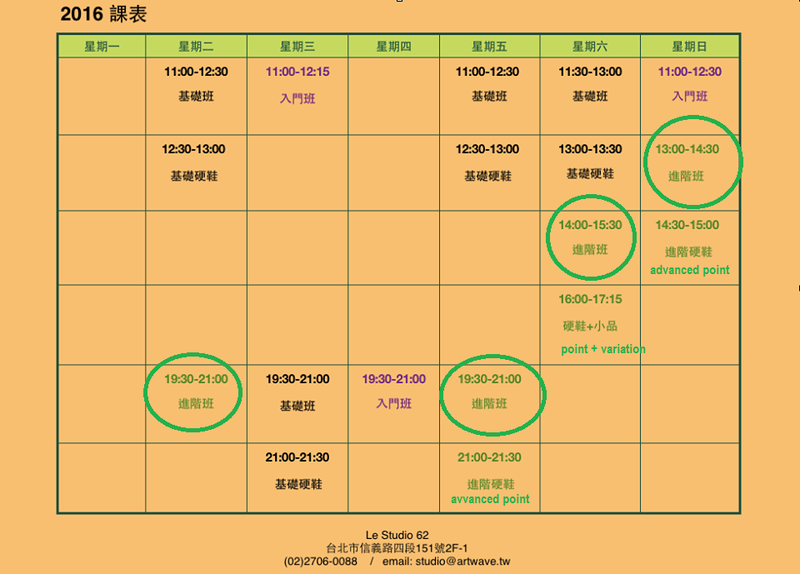 Thank you for posting your findings on ballet in Taipei. It is what I wanted to know to fill out my activities for my long term future projected intention to move to Taipei to take refresher Chinese Language study. I plan to supplement that effort with ballet classes, Pilates and yoga. Thank you! I appreciated this very much! Took some ballet classes at Wuyi and O-Dance. Both good. Wuyi’s pace is a bit more advanced than O-Dance. You’re welcome Chen! I hope i could suggest more. I’ll ask the girls there where else is nice to take ballet in Taipei. Thank you! Will update when i go back next month. I heard of this other school too! Thanks for this! This is very, very helpful. But would you know any that offers the Royal Academy of Dance syllabus?